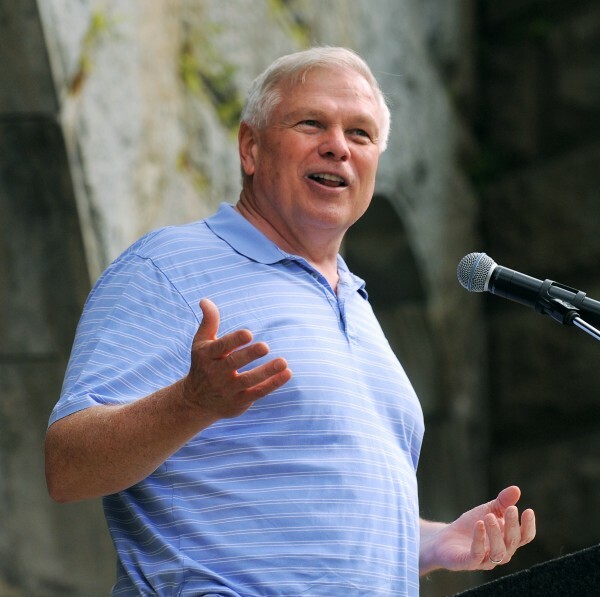 In this July 2012 file photo, Boston-based conservative radio talk-show host Howie Carr speaks during the Economic Freedom Festival at Fort Knox in Prospect. PORTLAND, Maine — According to Howie Carr, the path to victory for Republican Gov. Paul LePage’s re-election bid goes through one man: independent candidate Eliot Cutler. That was the thrust of both opening and closing remarks by the Portland native turned conservative radio talk-show host, speaking Saturday morning to the Cumberland County Republican Convention at the Westbrook Middle School. The radio talk-show host was alluding to the conventional political wisdom that Cutler — who came a close second to LePage in 2010’s gubernatorial race — will siphon votes from six-term U.S. Rep. Mike Michaud, the Democrat’s presumptive nominee for the Blaine House. Carr played more the role of stand-up comedian than political organizer as he lambasted the likes of President Barack Obama, Maine’s newspapers and House Minority Leader Nancy Pelosi, D-Calif.
Maine Democratic Party Chairman Ben Grant responded to Carr’s comments, saying he knew the party would need to be “vigilant” of GOP strategies to win by division. It’s a sentiment not shared by the LePage campaign, who on Saturday said the governor will be propelled to victory by his wide support, not through Election Day arithmetic, and that the entertainer does not speak for the governor or his campaign. At the heart of Carr’s statements is the assumption among Maine’s political operatives and observers that LePage cannot win an election by pursuing 51 percent of the vote, and thus is benefited by a three-way race. A Critical Insights survey last fall showed that more than half of those polled disapprove of the job LePage has done in office. That figure has been fairly constant since LePage was elected. If that’s the case, LePage must seek to divide the vote between Cutler and Michaud while retaining and energizing his base — the roughly 38 percent who elected him in 2010 and who seem to have stuck with him for his first three years in office. Of course, that take on the election cuts both ways: Knowing that LePage’s base can likely be counted on to stay with the governor, Michaud and Cutler both need to make the other as irrelevant as possible if either is going to win. In recent months, the two candidates have been engaging in what some have called a “primary-like” campaign battle. On Saturday, Cutler’s communications director, Crystal Canney, called Carr’s comments “more of the same old partisan politics,” and she said Mainers of all political stripes are backing Cutler. Littlefield said Saturday that Cutler has never played into LePage’s election chances, and that internal polling throughout the 2010 campaign predicted the governor’s victory regardless of how many candidates were in the race. Carr was one of several speakers who rallied the party Saturday ahead of upcoming elections in November. The mood was hopeful, as party operatives and elected officials stressed the importance of local party activists and praised LePage, U.S. Sen. Susan Collins and GOP lawmakers in Augusta. Several speakers, including House Minority Leader Ken Fredette, R-Newport, said the presence of Collins and LePage at the top of the ballot in November could have trickle-down effects on other Republicans running for office in Maine. Republican lawmakers also urged party activists to take up the banner against Medicaid expansion, the top priority for legislative Democrats this session. Democrats say the expansion will save the state hundreds of billions of dollars while providing MaineCare to roughly 70,000 low-income Mainers. The GOP and, most notably, LePage, point out that MaineCare already eats up 25 percent of general fund spending and say expansion will only “cannibalize” other government services. Sen. Jim Hamper, R-Oxford, a member of the Legislature’s Health and Human Services Committee, said he expects a compromise expansion bill by two moderate GOP senators to be presented to lawmakers this week.